And of course, with soup one must have bread. This particular loaf started with a kitchen disaster. I had planned out my mushroom-barley soup, and set my little heart on pumpernickel bread to go alongside. I’ve had Deb Perelman’s Russian black bread bookmarked for years now, and the moment was ripe for seizing. So I measured out some warm water in a measuring cup, stirred in a packet of yeast, and set it on the counter while I went about collecting ingredients. I needed molasses, which was hiding on a high shelf behind several bottles of vinegar. Thinking about it now, I should have realized that the rice vinegar was way too precariously perched. But I didn’t. I reached up for the molasses. There was a crash, a thud, a shriek–mine, I suppose–and a rumblerumblerumble as the rice vinegar bottle rolled away across the floor. I looked down; my pants were covered with yeasty water, and the kitchen was covered with shattered Pyrex. The measuring cup was no more. It took the better part of an hour to clean up the mess. By the time we picked the last shards out of the sink, it was less than two hours to dinnertime. We had friends coming over. There was no way I could make, knead, rise, shape, rise, and bake another loaf in that amount of time–and, even if I could, I didn’t have enough yeast to do it. But I wanted bread. I needed bread. Fast. 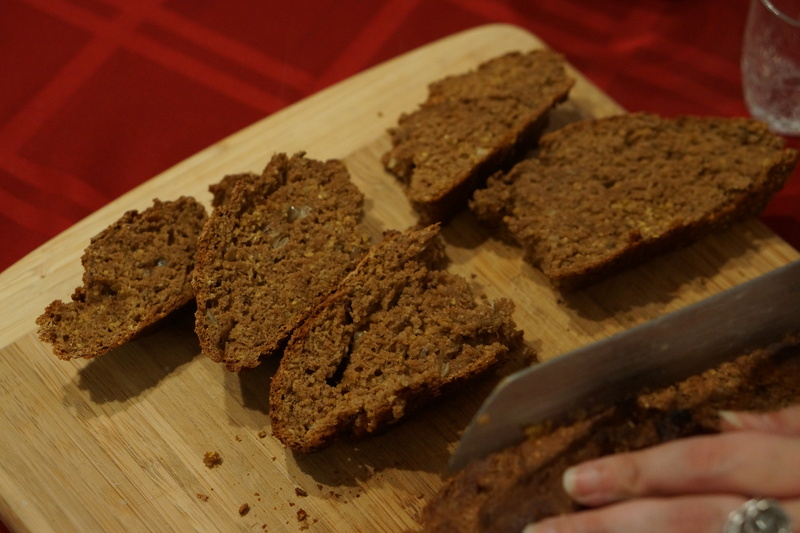 I thought of my go-to quick soup bread recipe, the Irish soda bread. What if I fiddled with that recipe, adding flavors that mimicked the pumpernickel I could no longer make? Would that even work? Yes. Yes, it would. And what a relief. The dough turned out a little stickier than in the original version, but it baked beautifully, coming out of the oven with the same rough, shaggy crust and pillowy interior. It tasted just the way I wanted it to, with the familiar ping of rye and the sweet bite of molasses and shallot. The slices stood up beautifully to a long dunk in a bowl of soup, sponging up just enough to make a satisfying bite. The entire loaf disappeared in 10 minutes, maybe less. I was too busy nibbling to notice. One of these days I’ll get around to making that black bread. But knowing that I can churn out a mighty tasty pumpernickel-like loaf in under an hour is mighty seductive. This one will be happening again–no broken glass this time. I’ll be honest. I don’t really get the whole kale thing. Yes, it’s dark and leafy and pulsing with iron. Yes, kale chips are tasty (although, so is almost anything else, if you toss with oil and salt and roast it to a crisp). But I’m really not convinced that kale is the hot, trendy, it-girl food of the moment. I’m just not a huge fan, no matter how delicately it’s sauteed or how vigorously it’s massaged. Eating a kale salad, to me, is like chewing the rough end of a bottle brush. Now. With all that said, I’ll be the first to admit that kale has its place in the world. Say, for example, in this soup. Mushroom barley soup is a classic on its own–and with good reason. As in so many great Eastern European foodstuffs, the mix of hardy grain and earthy fungus is a source of comfort, a taste of home. But with a mess of kale leaves cut into ribbons and wilted into the pot, it becomes something else entirely. 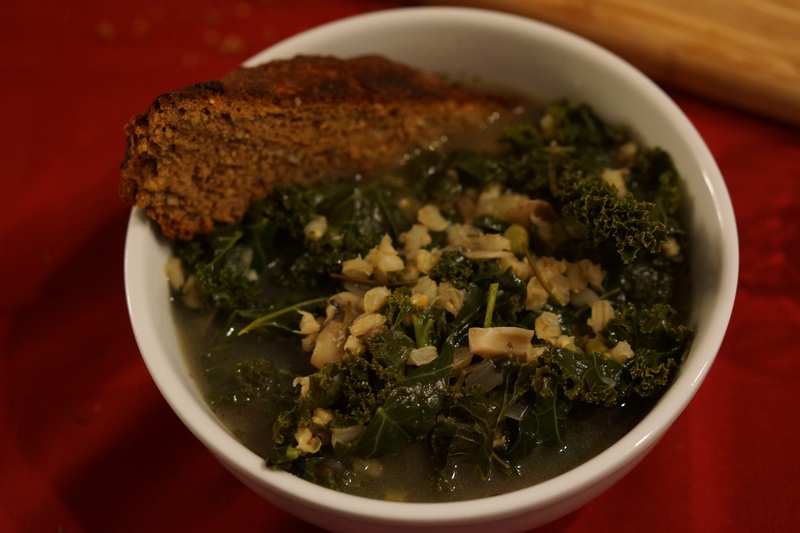 The broth softens the kale’s brushy edges, making it tender and supple. Suddenly, a stodgy old favorite becomes a hearty winter meal in a bowl, fortifying and warm without the attendant weight or guilt. This is the kind of soup that demands a good gutsy broth. For the photographed batch, I raided my freezer for rich, chestnut-colored turkey stock, made from the carcass of my family’s Thanksgiving bird. If I didn’t have that, my first choice would probably be beef stock; normally I don’t go in for big cow flavor, but beef loves both mushrooms and barley so much that it seems like a natural. If you prefer a vegan soup, just swap out the stock for a strong vegetable broth–something dark and mushroomy, I would think. Yes, kale has its place. Keep your massaged bottle-brush salads; I have my soup bowl. There’s so much here to chew on. The hypocrisy of Coke claiming to be an ally in the fight against American obesity, when in fact they are one of its biggest contributors. The fact that 180 “low- and no-calorie choices,” out of a portfolio of 650 beverages, is laughably small. The insistence that calories are the only thing that matters when making healthy choices. The cheerful glossing over of artificial sweeteners in Coke’s reduced-calorie offerings, despite the fact that we have no idea whether they’re better for us than sugar. The fact that an anti-obesity ad features not one recognizably overweight or obese person–the people shown making healthy decisions are already slim. But here’s the thing. Coke isn’t acting in a vacuum. They’re using airtime to subtly reinforce a message that already saturates the air we breathe: obesity is our fault. We, the consumers, bear the responsibility. Coke is trying. Really, they are. But in the end, we’re the ones who decide what goes into our bodies. The corporations can’t save us from ourselves. This isn’t about obesity. Not really. It’s about putting us in our place. So go ahead, Coke. Be cynical. Make us believe you’re on our side. Make us feel guilty, and thirsty, and dumb. It’s nothing worse than we already hear, every day we’re awake and alive. And until that constant hum changes pitch, I refuse to let it distress me. I have found my perfect carrot cake. Let me explain. 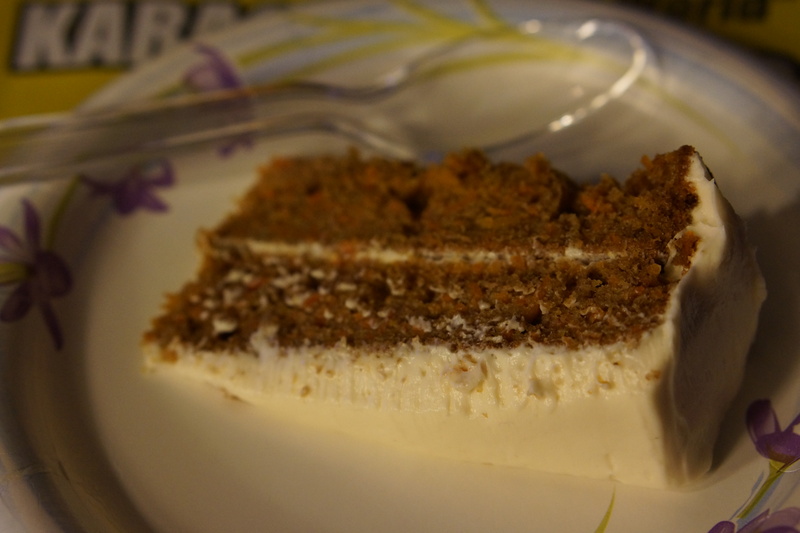 Ever since I can remember, I’ve adored carrot cake. If someone were cruel enough to make me choose my favorite kind of cake, carrot cake would come out on top. The combination of cinnamon, carrot, and a rich moist crumb just does something to me. It’s homey, old-fashioned, a little retro, smelling of cool weekend afternoons in a warm kitchen with Mom and a mixing bowl. And, of course, there’s the frosting–cream cheese, always cream cheese, sweet and white and just gooey enough to be fun. A good carrot cake can get my juices going like almost nothing else. But. As with so many other things I love, I’ve found myself getting picky over the years. There are a lot of mediocre carrot cakes out there. I don’t want a cake that tastes like a muffin, with big floppy crumbs and intermittent airy pockets. I don’t want health food carrot cake, heavy and dense and aggressive with the carrots. I don’t want raisins, or walnuts, or canned pineapple, or coconut flakes (coconut flakes? really?). And I definitely don’t want any of your “it’s just a delivery system for frosting” nonsense. If I wanted frosting, I’d eat frosting. So what do I want? I want this cake, the one I made for my birthday last week. It’s fluffy and plush and almost melts away on the tongue. At the same time, it’s sturdy and spongy enough to stand up to the tip of a knife or the side of a fork. It’s beautifully fragrant, with cinnamon and orange and just the quietest, shyest whisper of olive oil. It’s that magic medium, sweet-but-not-too-sweet, with just enough brown sugar to make it unmistakably a dessert. It’s unbelievably moist, the kind of dewy moisture that only comes from brown sugar and olive oil working in tandem. And it’s first and foremost a carrot cake, with tiny orange strands threaded delicately through the brown batter. Oh, and that frosting. That frosting. It’s a cream cheese frosting, all right–not even a slip of butter to fatten up the proceedings. Just cream cheese and powdered sugar, whipped until light and lush. I added a drizzle of dark maple syrup, too, for a boost of resiny sweetness. This is my favorite frosting I’ve ever made: just the right kind of sweet, thicker and tangier than its butter-based cousins, but no less creamy and wonderful when it’s clinging to a mass of cake. This, my friends, is a lasagna to be reckoned with: decadent, woodsy, gooey, salty, cheesy, meaty, dense. It’s also an elaborate project. There are noodles to prepare (more on that in a minute); a head of radicchio, sliced and roasted; a pile of mushrooms, sauteed to golden-edged limpness and doused with white wine; a pungent, garlicky white sauce; and four–count ’em, four–different cheeses. This is an all-afternoon Sunday kind of meal, for showing lots of love or making a great impression. 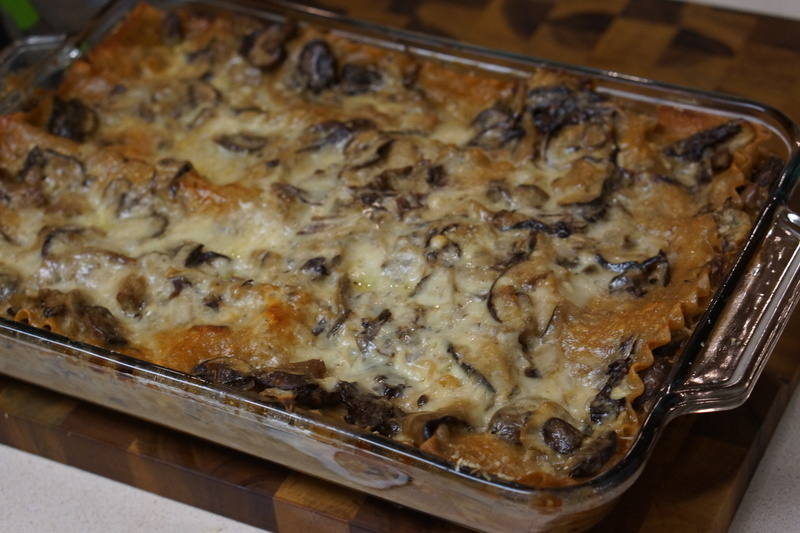 And if you persevere, you will be rewarded with the richest, tangiest, most profoundly savory mushroom lasagna you’ve ever tasted. Because this is a special-occasion dish, the mushrooms matter. You could use a jumble of fresh wild mushrooms, if they’re available and affordable. They weren’t when I went shopping, so I cheated. I used a mixture of fresh and dried mushrooms–in this case, a pound of creminis and an ounce each of dried shiitakes and dried oyster mushrooms, soaked in hot water until pliable. The dried mushrooms are damply intense, the fresh ones are meaty, and together they’re dark and murky and altogether perfect. Oh, and about those lasagna noodles: I know you’re supposed to boil them first. But I don’t like the slippery wateriness that sneaks into many lasagnas that way, and besides, I don’t have a pot big enough to fit the noodles without cracking them. So this time, I took a cue from my dried mushrooms: I laid the lasagna noodles flat in a pan, covered them with boiling water, and let them soak while I prepped the other ingredients. The result? Supple, completely intact noodles that reached the perfect al dente texture in the oven. I’ll never boil a lasagna noodle again. I woke up this morning with pillow lines on my face and fuzz in my mouth. It was a long, solid sleep, the kind that comes after a night of too much party food and champagne. This time last year, I’d be sitting here quietly racked with guilt, counting the ways that all that bread and gelato and booze was going to destroy me from the inside out. But today I’m calm. I’m happy. I’m letting myself off the hook. Something shifted in me in 2012. I’m not sure exactly when it happened, or what prompted it, but the past few months have been profoundly different than anything I’ve experienced before. I don’t really know how to describe it, other than this: I just let go. I dropped the guilt. I decided to eat what I wanted to eat, when I wanted to eat it, and see how my body responded. And suddenly, everything changed. For the first time in my life, food isn’t bedeviling my every thought; I’m not ping-ponging back and forth between strict dieting and angry overindulgence. I find myself choosing to eat foods that are good for me, but also that make me irrationally happy–prosciutto, hummus, broccoli, garlic, salmon, curry, dumplings, wine. I’ve been walking miles every day, without pain, without frustration. I’m letting how I feel dictate what I do, instead of the other way around. And it’s working. I’ve never lived this way before, celebrating the good choices without holding onto the guilt of bad choices. It feels like a strange and slightly surreal way to live, but it’s also shockingly normal. I’m getting to see what it feels like to eat normally, exercise normally, wake up in the morning with the same groggy neutrality I see in my friends and family. The last time I went in to see my doctor, she said it’s like I’ve finally opened doors I’ve been knocking on since I was 13. Feels good, dammit. So here’s a drink to celebrate. For the morning after New Year’s, let’s make it a sunrise drink. Sam invented this one at a party a couple months ago, and it’s been in high demand ever since. One of our friends, after one or two too many, insisted that we call it “Liquid Sandstone.” I call it a “Gingerflower Sunrise,” a nod to the ingredients list–gin, ginger ale, elderflower liqueur, and grenadine for the sunrise effect. It’s a beautiful drink, intensely sweet and pleasantly fizzy, with a strong herbal kick. It feels like the perfect way to welcome in a newer, fresher year. Onward to 2013!